Honesty and integrity come from actions, not words. At Gorham Printing, those actions underscore everything we do, from customer service to shipping the completed books to your door. The passion we have for printing a beautiful, well-made book enables us to take ownership of our clients' projects. There is no greater satisfaction than delivering a completed book to an author who has put their heart and soul into their work. We pride ourselves on being a complete source for all of your book design and book printing needs and are always striving to stay on the leading edge of technology in order to improve efficiency. Our mission is to exceed client expectations by providing the highest-quality book printing possible in a timely manner. We will continue to evolve as a diversely skilled, fast-moving team of professionals ready to meet whatever challenges our authors may face. We improved our website to make it easier for our clients to request estimates, place orders, check proofs, or transfer files online. We hope you find it as helpful as we do. In today’s fast paced world, more and more consumer products are being manufactured overseas. Not at Gorham Printing. We’re proud to let you know our talented design services and quality production of perfect bound (softcover) books are done right here in Western Washington. 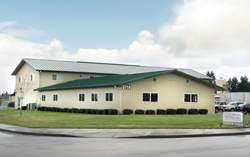 Our 7,500 square foot plant in Centralia, Washington holds the customer service, design division and pre-press in the front office, a digital printer quarters, press room and production area for binding, trimming and boxing. Two of our binding options (hardcover and plastic spiral) are outsourced only a few hours away in northern Oregon. Working with Gorham Printing, you’re assured that your book is printed in the United States. Our customer service is second to none. No multi-level phone menus, just one-on-one personal service. Have a question at midnight? Shoot us an email and we’ll get back to you the following business day. At Gorham Printing you are not just a number lost in a cavern of 24/7 production lines. Being a smaller, family business our strength is to make your book printing experience as simple and stress free as possible. Our staff includes exceptionally talented graphic designers, knowledgeable prepress assistants and an experienced bindery and production division to make your book a quality product. Gorham Printing is located in the scenic Pacific Northwest of western Washington, however, our easy-to-access website brings in business from around the country. Though we only work with authors and publishers in the United States, local authors have the chance to sit with us to discuss their book project and tour our production facility. We enjoy making it easy for independent publishers to see their dreams come true. In 1976, Kurt and Norma Gorham opened a commercial print shop in downtown Centralia, Washington. They entered a world of fast-paced deadlines, building a reputation for integrity and professionalism with larger corporate clients. After 15 years in commercial printing, they decided to change their focus to book printing. Over the years they have kept pace with the evolution of printing technology. Major advancements in the methods of a mostly mechanical pre-press area have now changed to a completely computerized book design department. New digital technology has aided in the pressroom and bindery area as well. Much has changed over 30 years, but Gorham Printing continues to thrive and grow into the future. Gorham Printing opened at their new location in December, 2006. Their 7,500 square foot building is at the Port of Centralia, on the corner of Mahoney and Steelhammer streets. The location is close to Centralia and Interstate 5 allows easy access.